By creating challenging and experimental works, RESTORE approaches the Origin of Aesthetics. The theme of the works is to visualize the spiritual world with touches of humor in the expression. 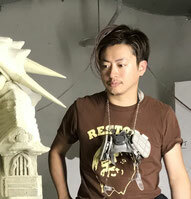 Back from his days an undergraduate student of Kyoto’s university of arts, Junnosuke, gifted in realistic sculptures such as “creatures”, has been recognized as a talented sculptor, and has sculpted many works sold throughout the world.To pursue the fusion of hobby and art founded "RESTORE". It began to expand aiming a mechanism for supplying the "work" as the "Toy". With Junnosuke’s transcendent sculpting sense and distinctive perspective of the supernatural world, RESTORE offers various original items pursuing spiritual values.From 2011, Junnosuke and RESTORE expanded into the Soft Vinyl world. With detailed sculpting and fusion with other materials, RESTORE aims to create works that will overturn traditional images of Soft Vinyl figures. Any works with fearful features and image. Such are based on the Buddhist philosophy that the mortal world is self torment and to want something is foul passionIn Japan, it is thought that the ultimate of wanting something is lust, and such energy is thought to be something negative in the Japanese Mind.However, in the modern world, it is thought that balance is important, and that you do not have to deny everything. Also, tracing back human history,to materialize the non-material spiritual body and to be able to visualize it, was thought to be a act of striving for the truth (Idea). Seeking for the truth (Idea) is an unique human value and such values lies in the base of ideology and philosophy. It is considered to be more beautiful as one becomes closer to Idea (nature=the ultimate form of the spiritual body) Whether if the two ideologies originated from one or if they were different from the beginning, is unknown. But in modern day Japan, you can say that the two ideologies are mixed, as seen in sculptural works. When you conclude that truth is the human spirituality that continues to desire (or rather more, bottomless lust), the appearance may be as beautiful as it may be ugly. Thus, it may be said that true beauty exists in repulsiveness. RESTORE often uses ritual elements. Ritual is a dogma that strongly recognizes the relationship of the material worldand the spiritual world. Torii (Entrance to Japanese Shrines), Ofuda, Church are factorsthat amplifies the image of the spiritual world. When feel RESTORE univers from ritual element,some kind of the idea or feel beauty. 2004 debut as a prototype figure sculptor by "GREMLINS"
2009 launch to original brand "RESTORE"
Copyright (C) RESTORE All Rights Reserved.